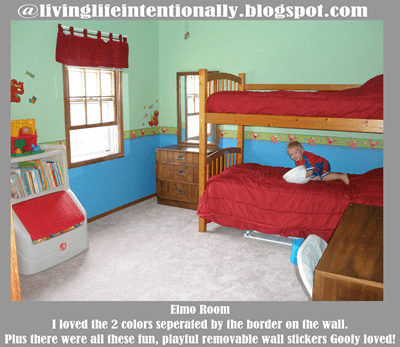 I love creating fun, special spaces for the kids! Their rooms are no different. I love tapping into my (and my kids) creativity to make their rooms fun. So being summer and all we decided to give Goofy’s room a makeover. Goofy was especially excited because he is now old enough to help Mom paint. Yep, in our family Mom is the painter. 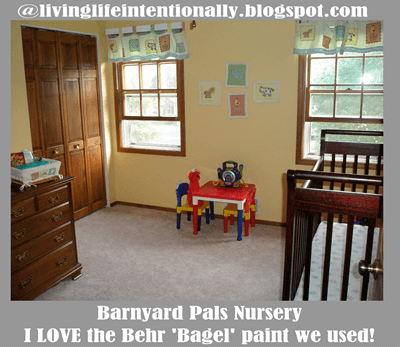 I love painting – for $20 you can give a room an entirely new look and feel a sense of accomplishment when you are done. Goofy became really into knights & castles around 5. After looking for the perfect addition and not finding it I decided to try my hand at sewing. With no pattern I used fabric to convert his bunk bed into a castle. He could get in though the door. The 3 windows also open! 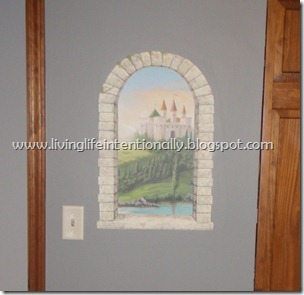 We found some great castle wallpaper accents for around the castle and for windows around the room. Finally I made banners to sit over the valance and a shield for our Knight. Goofy was SO EXCITED about his room. And we all REALLY loved the grey for his walls. And that takes us to our summer room makeover. Goofy moved to a smaller room to allow Minnie & Tinker bell to room together (when Tinker bell can climb out of the crib – thankfully she hasn’t mastered that skill yet!). After floating tons of ideas by him (Lego, Mario, Space, Trains, etc.) 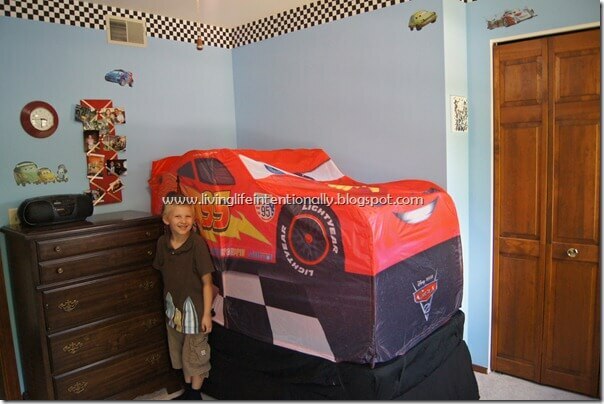 he settled on a cars room. 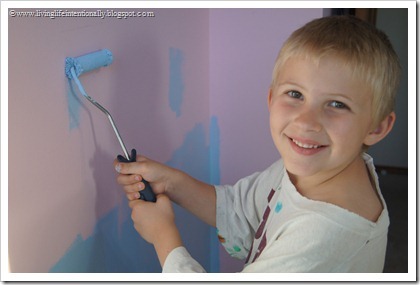 We painted his walls blue – his favorite color. 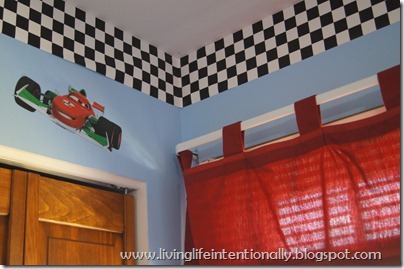 I got a checkered racing border which I feel added a lot and was very simple to put up. 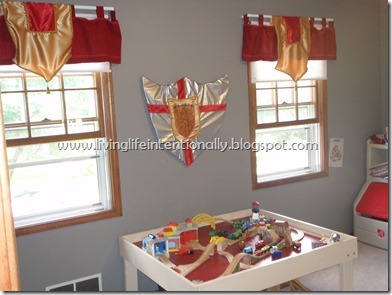 We reused the red valance & comforter he’s had for the past 6 years – what can I say I’m frugal! 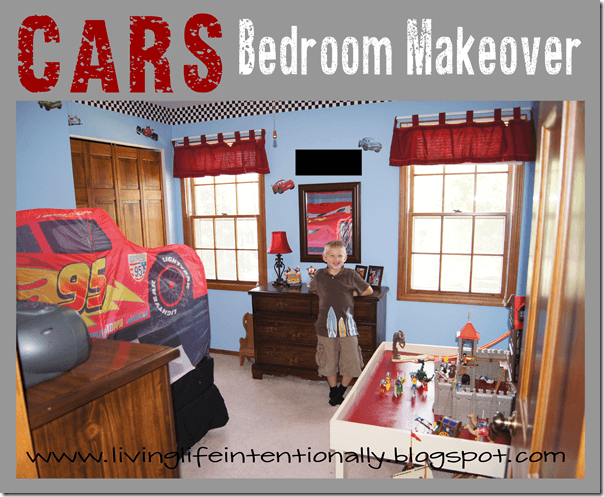 I found some fun, Cars 2 wall stickers which really pulled the theme together. His train/castle table we made him was already painted the accent red so it was good to go. Goofy was so excited we could finally mount his birthday present – a Hot Wheels car track – SO COOL!! The one new splurge he got was a cars bed tent. 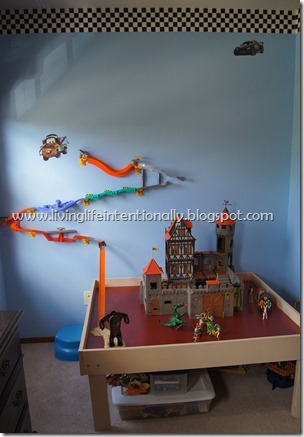 This was so fun and a perfect addition to his room. I found a black bed skirt & fitted sheet so McQueen could race on a black ‘road’. It came out pretty cute, didn’t it. The one thing you can’t see on the wall is his name. 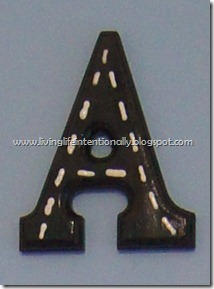 I spray painted each letters black and used white paint to make lane dashed – isn’t that fun?! 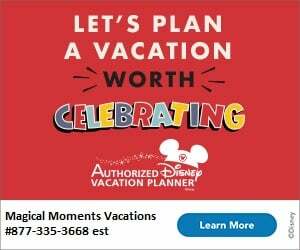 So what do you think of Goofy’s room makeover? 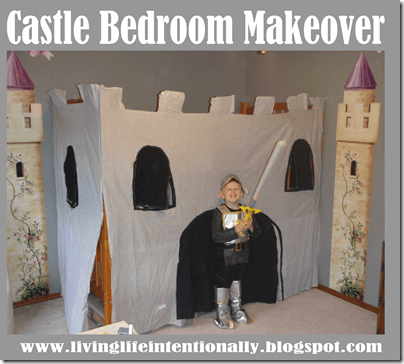 Does your child have a themed bedroom?